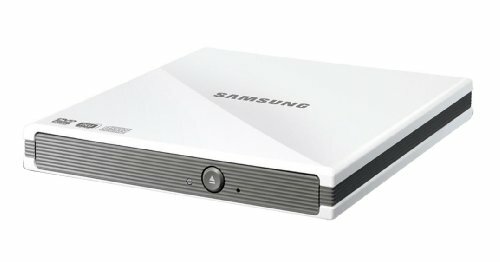 The first Samsung external DVD drive that is compatible with Mac as well as PCs. A "must have" accessory for all NetBook users. The SAMSUNG 8X Tray load External Slim DVD Writer is designed to provide the highest quality DVD functionality in a sleek design that is not much larger than the CD/DVD itself. Simply plug it into your USB port and you are ready to watch movies, install software, copy photos, play music, etc. Furthermore, this model supports both 12 cm & 8 cm discs. The Manual Disc Eject function allows the disc to be ejected even when the power is off.